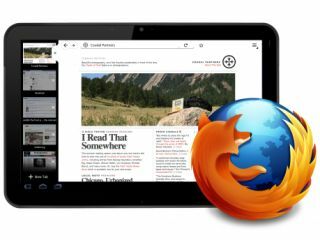 Mozilla has shown off its upcoming tablet browser for Android Honeycomb tablets, with a series of screenshots highlighting its clean new design. Although it's largely the same as its existing Android browser for smartphone handsets, the upgraded Firefox has some nifty new enhancements for larger screen sizes. For example, the bigger screens mean that Firefox tabs can make a comeback, having been hidden away on the smartphone browser. In landscape mode the tabs will be permanently displayed in thumbnail form on the left of the screen, while portrait tidies them away into a menu bar at the top. The browser's look and feel has also been designed to fit with Honeycomb's own UI; Mozilla describes it as "minimalist design language" tempered with "familiar visual elements". These elements include the big back button and curved tab shapes that you may remember from such browsers as Firefox for Android and Firefox 5. And let's not forget the Awesomebar, which keeps your bookmarks and history nice and safe as well as syncing with your desktop browser activity. Mozilla still isn't giving away a release date for Firefox for Tablets, but with work on the software obviously going at some pace, we're wagering it shouldn't be too much longer before it hits our Honeycombs.